MEDICAL DEVICE DESIGN IS A HIGHLY REGULATED AND CONTROLLED PROCESS UNDER THE GUIDELINES OF ISO 13485 AND THE 21 CFR PART 820, AND MEDICAL DEVICE COMPANIES MUST FOLLOW STRICT CRITERIA FOR ESTABLISHING DESIGN CONTROLS AND RISK MANAGEMENT TO ENSURE THEIR DEVICES WILL BE SAFE AND EFFECTIVE. Once you've come up with an idea for a medical device, the next step is to create a medical device design that is safe and effective for the end user. Medical device companies must also establish design controls - a set of policies and procedures for documenting the steps in the design process and ensuring that the medical device you design fulfills its intended purpose and is both safe and effective for the end user. The key to an effective medical device design process is remembering that the device itself is not the only intended output of the medical device design process. You are also expected to produce a user manual for the device, clearly documented specifications that explain how the device is constructed and how it works, a detailed risk analysis that quantifies the risks associated with your device, technical files, and the results of any testing or studies that you conduct (product validation, bio-compatibility, clinical risk assessment, etc.). How will medical device users and patients interact with the product? Where will the product be used? At home? At a hospital? At a clinic? What is the sophistication level of the person using the device? Will they have some medical training? None? What other products will be used with the device? DOCUMENT CONTROLS - WHAT'S REQUIRED? Design controls is one of the core processes of the quality management system (QMS) described in both 21 CFR Part 820 and ISO 13485. The requirements for design controls are so extensive that we've taken the time to write the most comprehensive guide available on the FDA's design control regulations - you can read all about it here. You'll have to determine your device classification and whether your device will be subject to design controls. Class II and III devices all require design controls, and Class I devices are mostly exempt with some exceptions. Prepare a design history file that shows your device was developed in accordance with the design plan and in compliance with the design controls regulations. For companies who begin medical device design without paying appropriate attention to the design controls process and other medical device regulations, establishing proper documentation and getting their device to market quickly becomes and impossible uphill battle. 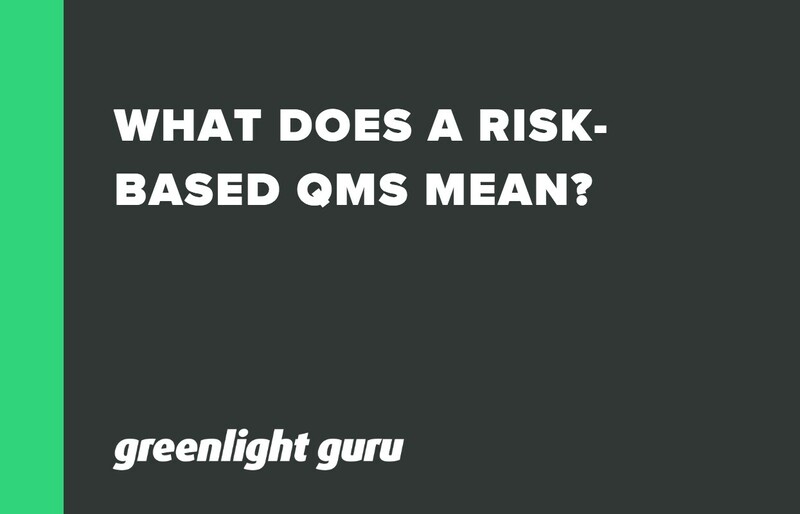 Greenlight Guru's eQMS is the quality management tool that medical device companies need to help ensure that design controls are established, followed and stored in compliance with FDA and ISO regulations. Medical device companies that wish to sell their products in the United States will have their quality systems audited by the FDA. Greenlight Guru makes it easy to store, access and share all of your design control documentation, proving your compliance with local regulations and helping you get to market even faster. 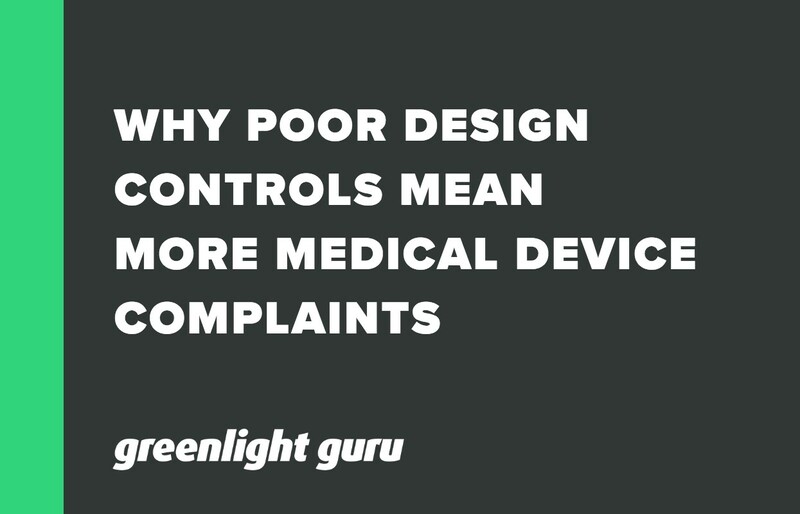 Learn why if you don't properly document design controls, you'll end up paying for it later with more medical device complaints. 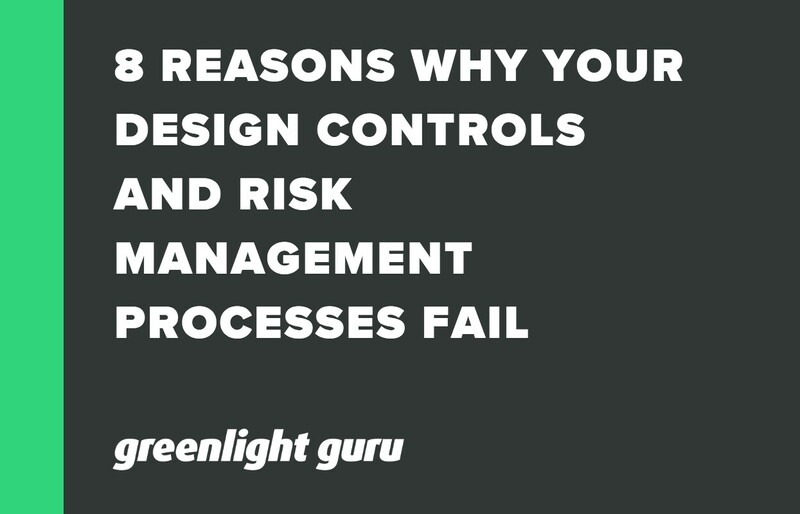 Here are 8 of the most common reasons design controls and risk management process fail and what you can do about it.